Well, hello! Thought you’d never hear from me again, eh? I promise I won’t be silent much longer. I’ve got some half-finished posts in the works, but to tide you over until then, how about a picture of some delectable pizza? Last night S and I independently started thinkin’ that we felt like making pizza for dinner. Once we discovered our mutual hankering, we wasted no time in whipping up a masterpiece of a pie. Because we weren’t keen on waiting for the dough to rise, I used this super quick and super easy dough recipe, which doesn’t require any rising or kneading time. I was skeptical, but the 1000+ positive reviews convinced me to give it a shot. It worked out perfectly, much to my hungry belly’s happiness and my make-everything-harder-than-it-needs-to-be perfectionist self’s surprise. In the interest of time and laziness, we topped our pizza with canned Muir Glen pizza sauce instead of making sauce from scratch. 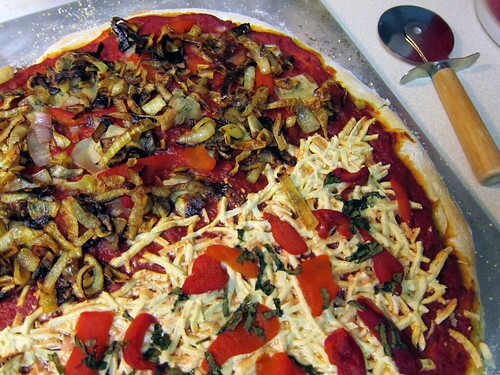 We covered one half of the pizza with mozzarella Daiya, basil, and roasted red peppers. The other half was a little more sophisticated; we topped it with caramelized onions and shallots, artichoke hearts, and more roasted red peppers. I can’t decide which half I liked better! And I have to admit that Daiya is growing on me. I still think it’s a little icky smelling, and it’s certainly no health food, but the occasional Daiya pizza definitely hits the spot every once in a while. Aaand that’s all I have for you today! What’s your favorite pizza topping? When I was in the US we tried Daiya and it didn’t take long before we started to like it. At first it was too rich, and had a funny taste, but I think in moderation it’s a really good product!